I tried a little experiment as I walked back from the Beyond Distance Research Alliance to the Department of Engineering the other day. You could try it for yourself. Walk around the university campus – or shopping centre – or another public place and count the number of people using mobile devices. Estimate the proportion of people using mobile devices – iPods, phones, whatever. Of the 48 people I counted, 20 were using mobile devices (most of them phones) – so about 40%. I “attended” the Follow the Sun conference just before Easter. I say “attended” as I was attending another conference in Canterbury at the time. But I joined in and found myself talking to my laptop in a crowded junior common room – utilising the free WiFi there. Ten years ago, people would have stopped and stared. I don’t think anyone batted an eye lid – there’s nothing more usual than talking to your computer. So can we really talk about the “virtual worlds” – about “online learning” – as if they’re something different to reality? This is the world in which we live. One which is densely interconnected. One in which the physical world that you observe is just one of several windows on the real world that you interact with. So I hope we can stop talking about e-learning soon. It’s not that I don’t enjoy talking about it – and I like writing about it and being a part of BDRA. But I hope that we’ll just take it for granted that this is normal – why would we want to teach and learn in any other way? Can Learning Innovations be Embedded and Sustained? On 28 April, 2010, Gabi Witthaus and Terese Bird attended a CAMEL meeting sponsored by JISC and which took place at Middlesex University, the theme of which was to examine whether the developments of the DUCKLING project can be embedded and sustained. Once the project is over, can teaching teams continue to use the technologies, findings and deliverables? 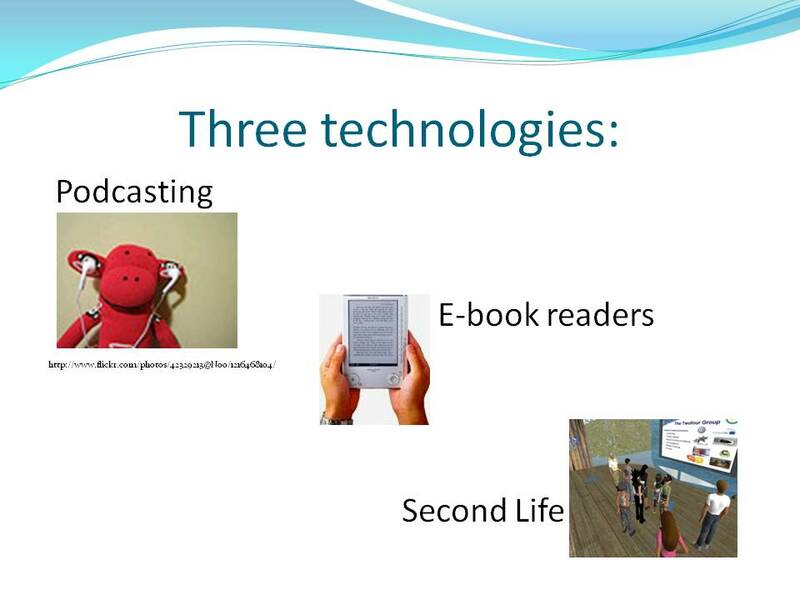 In this meeting, Gabi and Terese looked at the sustainability of each of the three technologies implented in the DUCKLING project — ebook readers, podcasting, and Second Life — as well as the pedagogy underpinning the use of each. Since the project is a joint effort amongst the Schools of Psychology and Education, and Beyond Distance, it was helpful to consider how each of the Schools implemented each innovation. Psychology used Second Life as a forum for role-playing and simulation, to give students a taste of the experience of living and working on an oil rig with its dangers and isolation, as preparation for their assignment to write a health and safety training manual for oil rig workers. Beyond Distance techies supported this work. However, the actual role playing and leading of the sessions was done by Psychology academics and could continue that way, with some tech support. To watch a YouTube video capturing some of the action of the students’ experience on the oil rig, click here. Education sent their students into existing language class forums in Second Life, where students observed and could participate in the classes. This was a very flexible way of making use of Second Life — students simply went in and signed up for classes already taking place pretty much 24/7. Observing language classes in Second Life has now been embedded into themodule as an optional activity. As long as there are such forums in Second Life, this activity is sustainable. Podcasts have been fully embedded into the Psychology curriculum for the masters programme in DUCKLING — especially as part of the dissertation-writing process. These podcasts been rolled out to all cohorts on that module. Psychology academics have been making and distributing (via the University VLE, Blackboard) podcasts without any help from Beyond Distance for months now. Education has especially recently begun to record podcasts for its Masters TESOL students, and again the work of recording and posting onto the VLE is straightforward enough to continue without difficulty after DUCKLING’s conclusion. A further aspect of the continuing use of ebook readers can be viewed from the point of view of finance. One department saw savings over printing and shipping stacks of handouts to students, by instead shipping to the students fully-loaded ebook readers. In some cases the students themselves experienced the savings, realising that they did not have to purchase hard copies of notes and choosing instead to simply read these on their ebook readers. Converting module handouts from Word format into format suitable for ebook readers (epub format in the case of the Sony ebook readers we are using) is not a very difficult process — click here for our instructions to do this. The fact that the iPad supports epub documents, public libraries are beginning to offer ebooks for download in epub format, and students are looking for reading material compatible with smartphones, presses the point that the use of this technology will only increase in future. We predict it will be sustained by popular demand.